Sometimes the best days out happen by pure chance. 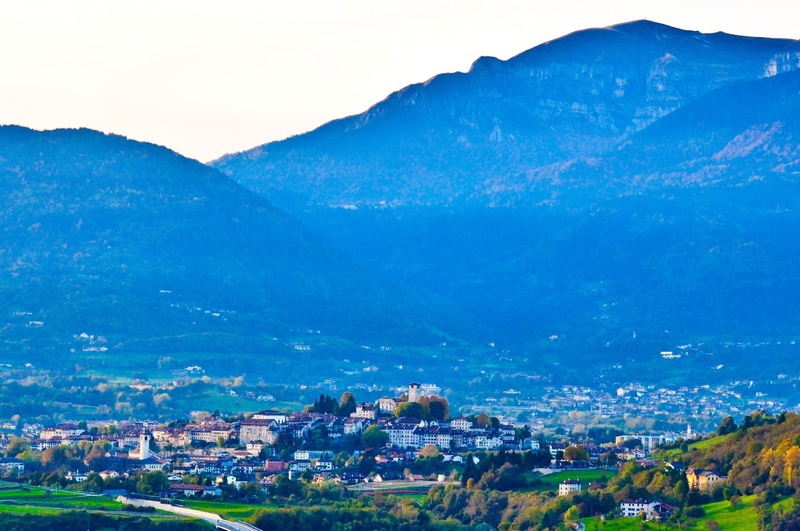 You see, there is so much to explore and experience where we live in Italy, so many towns, cities and villages with a wealth of historical sights, cultural traditions and modern attractions, that the sheer choice what to do on the weekend can be pretty overwhelming. After a couple of Saturdays, where we would be having long discussions as to where to head to, only to change our minds about dozens of times and by the time we would be finally piled in our little red car ready to drive off it would be about lunch time, we finally hit on a solution. Which is as simple as it sounds. For a spontaneous day out, we would do a search online and the first place which would catch our eye in the long list with results would be our destination for the day. No changing of mind is allowed. No ‘oh, hmm, let me just click on 1, 2, 3 more search results to see what else I could find’ thinking is tolerated. It is totally random. Akin to the old-fashioned method of closing your eyes and jabbing your finger against a paper map hoping that, miraculously, you will find Arcadia. 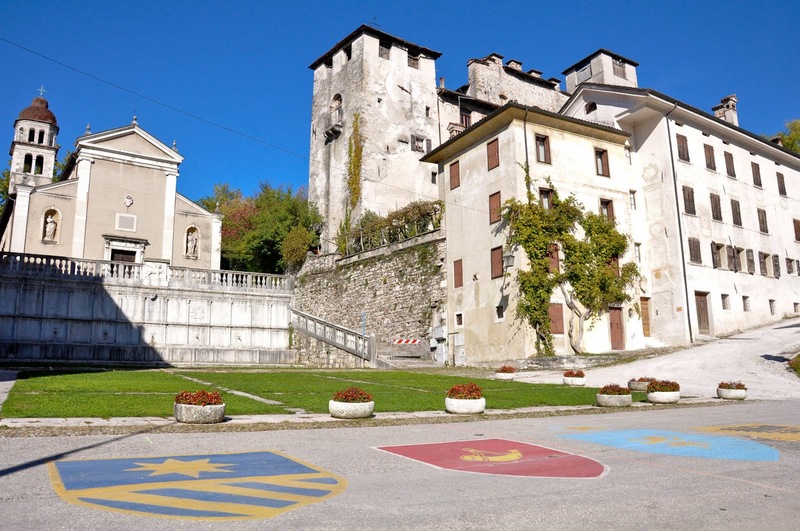 Have you heard of Feltre before? I am afraid, we hadn’t neither. 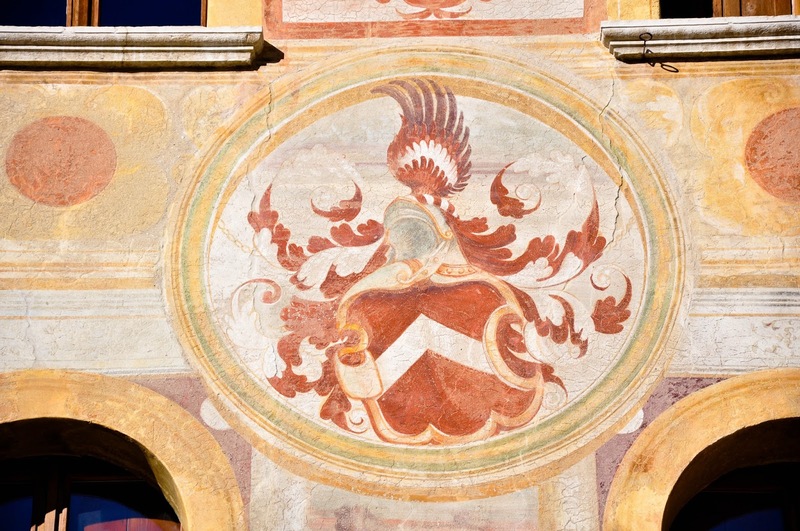 I am happy that we had a chance to rectify this though, as Feltre turned out to be a fabulous find. 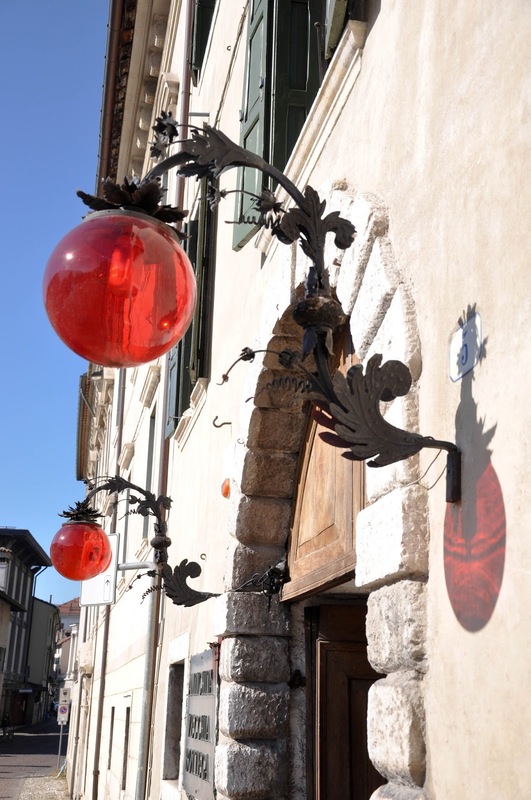 A little town cuddled on top of a small hill in a vast valley surrounded by the mighty peaks of the Dolomites, it had all the ingredients for a fantastic day out – gorgeous views along the way, atmospheric architecture, long-standing traditions and rich history. Plus sun, lots and lots of bright autumn sun which warmed the soul and made you feel happy and alive. 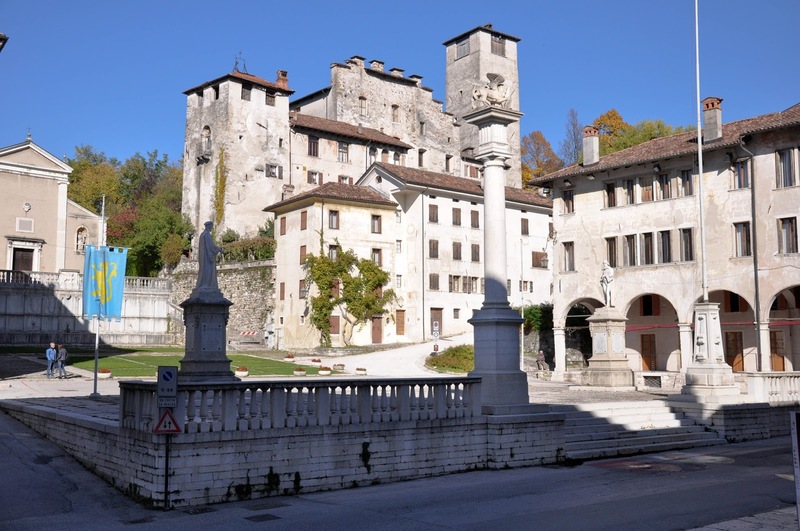 It took us about an hour and a half to reach Feltre from our current hometown of Vicenza in the Northern Italian region of Veneto. Just past Bassano del Grappa the road took us straight through the mountains and a long succession of tall peaks covered with dense forests and tiny villages at their feet marked our progress. A series of tunnels led us into the heart of the mountains, where a vast valley opened in front of our eyes. 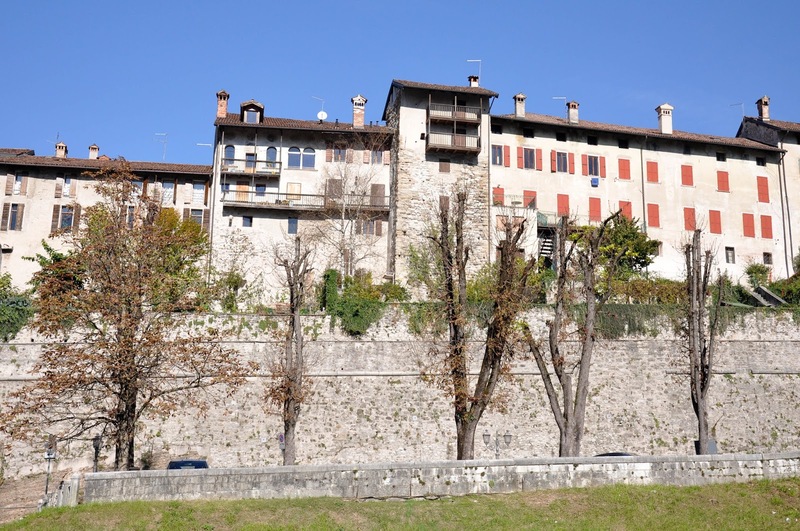 Feltre was the crown of a small hill right in the middle of it. Soon, we were cruising through the streets of the town. In all honesty its modern part was, how to put this politely, a bit nondescript, but we persevered, following the instructions of the GPS and soon were rewarded with the splendid view of the old town’s ramparts. Once a flourishing Roman city called Feltria, now the town lay sleepily on its hill dreaming of its glorious past. The cobbled streets were quiet and lined up with trees in their autumnal best. A short walk took us past the Cathedral. The small square at its back allowed us to admire the fortified position which the old town had. Somehow it reminded me of Edinburgh in Scotland. 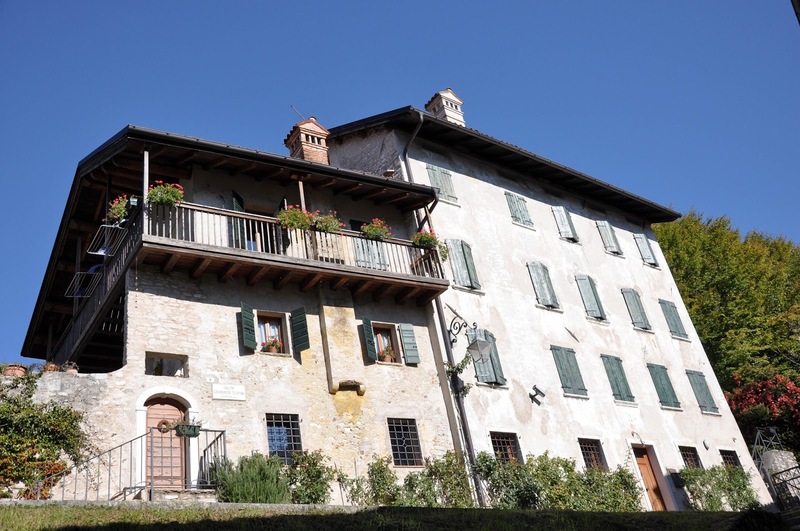 Although, much smaller, Feltre’s houses were standing upright on the sides of a steep hill which had been built up into large stone ramparts. Looking for a way up into the town, first we found a way down into its history. 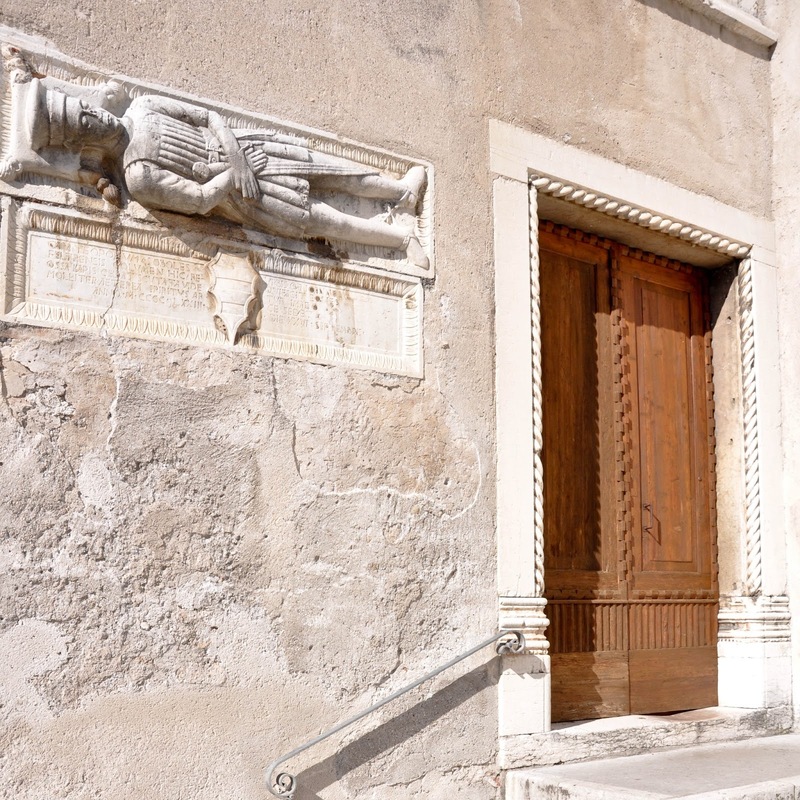 A small door left ajar in a small building standing right at the back of the Cathedral led us down a number of steps to an excavated area of 1000 square meters. We found ourselves standing in the middle of what once were the square of Feltria. Preserved foundations of houses and public buildings surrounded it. I have often wondered why old cities (or what has left of them) seem to sink so deeply in the ground that archaeologists need to spend a tremendous amount of time and effort to unearth them and discover their secrets. It seems that earthquakes, natural deposits of sands and debris, even the construction of new buildings tend to push deeper and deeper underground what once were big and glorious structures. It is like the past which is constantly replaced by the present and so it sinks deep into our memories and from there it seeps into our unconscious. So, it gets forgotten and yet it is always there, it is always the foundation on which we build new things, even though after a while we stop being aware of it at least on a conscious level. 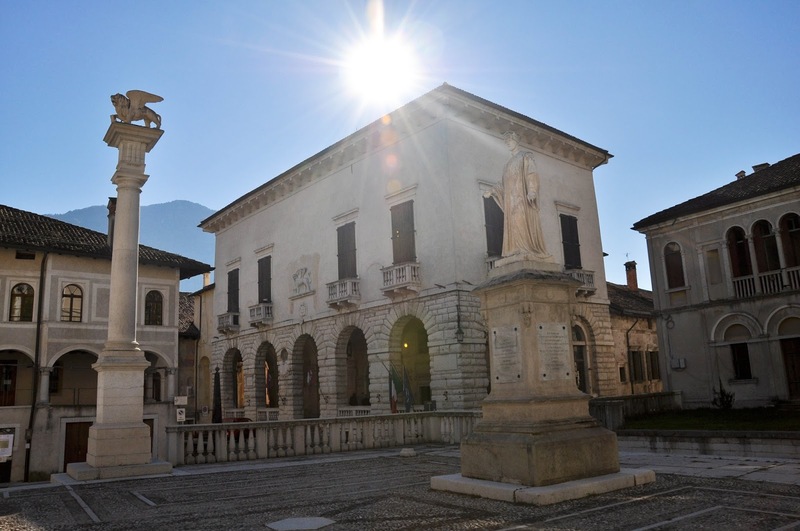 So, there we were, able to enter into the past, see the checkered black and white public square of Feltria which had been teeming with people and their emotions over 2000 years ago and now lay cracked and warped by the passage of time in front of us. Pictures were not allowed, so try to build a mental image, as I find, these have the biggest impact. We went back up the stairs. Outside the sun was shining bright. The ramparts stood in front of us and only narrow steep steps led up to their top. 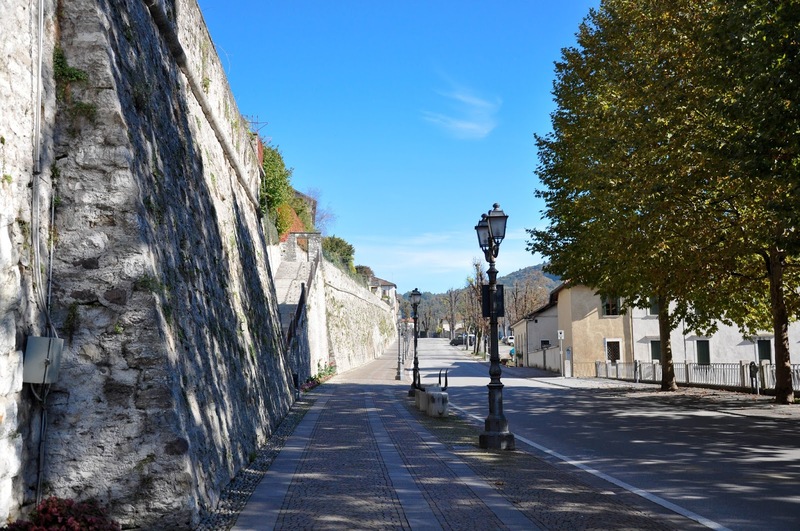 We had two options: either walk down to where the slope of the ramparts evened out with the street and enter the old town from there or attempt to carry the buggy and our little daughter up the steps. 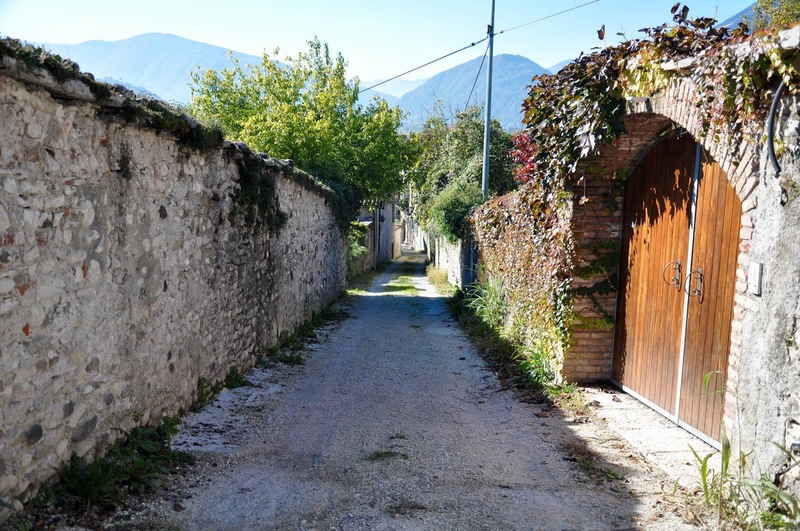 Just then we saw a huge tunnel cutting through the full width of the hill on which old Feltre is built. 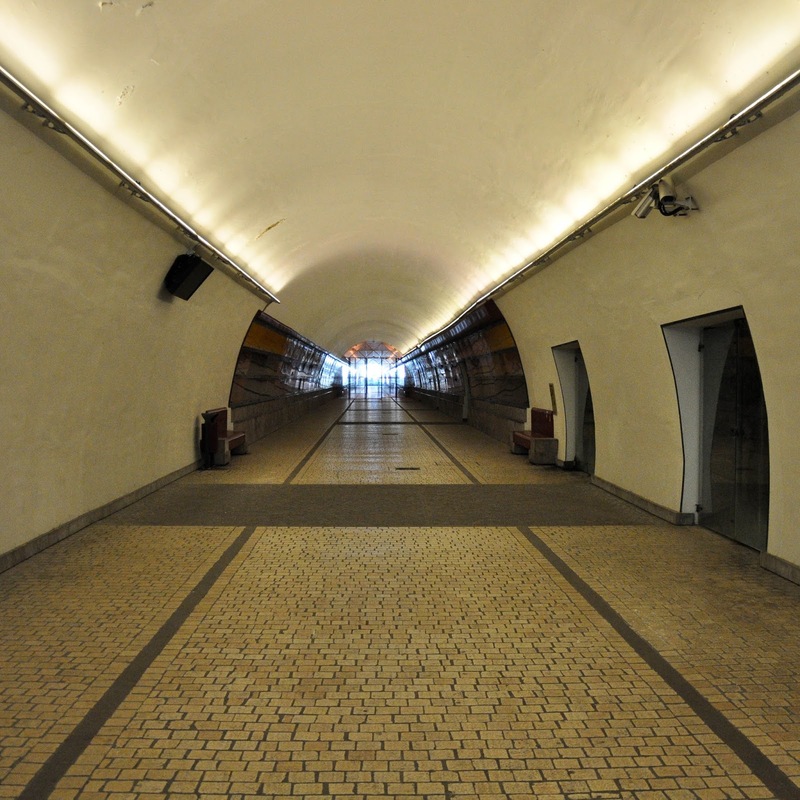 Large pictures were covering the walls of the tunnel telling the story of the town and illustrating in image and text the many sights which one should explore in it. Reaching the other end of the tunnel, we were faced with yet another steep set of steps leading up the hill. Just then a little old lady came with a brisk step down them. ‘They can’t be that steep!’, I reasoned, so we grabbed the buggy and the baby and off we went. It seemed I am in a much worse shape than that little old lady, as atop of the hill, I was gasping for breath. We found ourselves at the back of a row of houses with large walled gardens. We followed the path covered with large uneven cobbles. It was very quiet. Every balcony was adorned with flowers in bloom. Lush creepers were covering the thick walls. Step by step and admiring the houses and buildings on our way, we reached the town’s square. 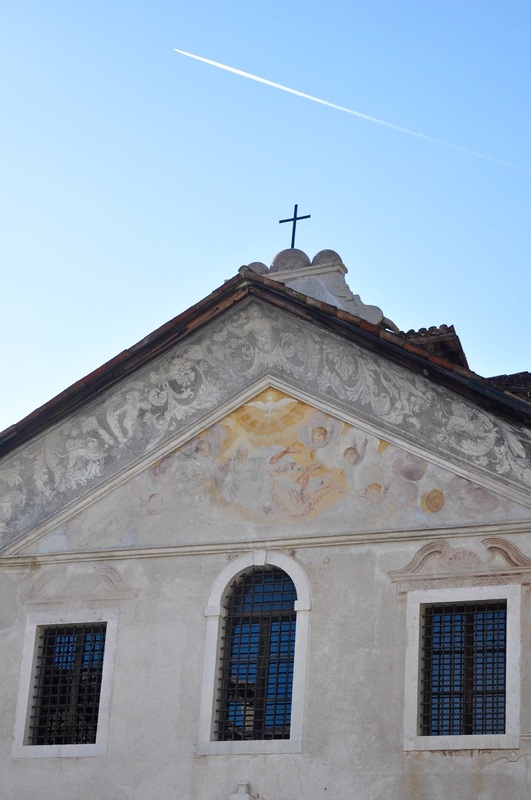 Rebuilt in the 16th century in the Venetian style, it was completely covered with stone slabs. 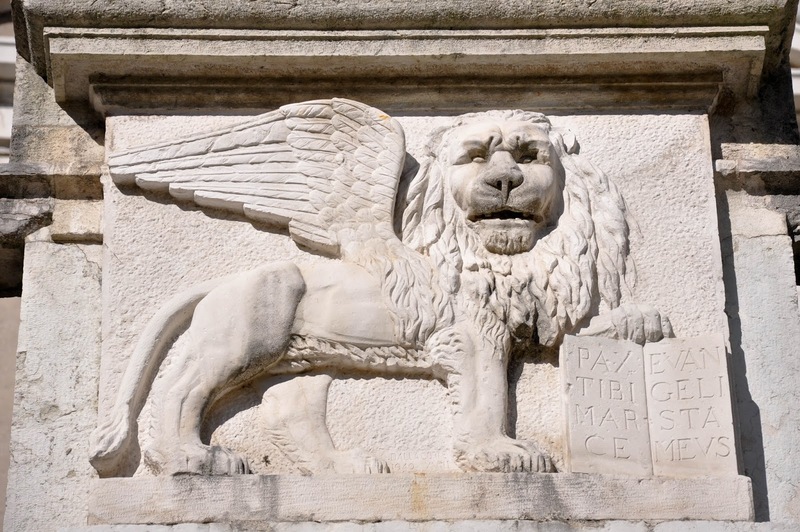 A pillar at its end was crowned with the Venetian lion. 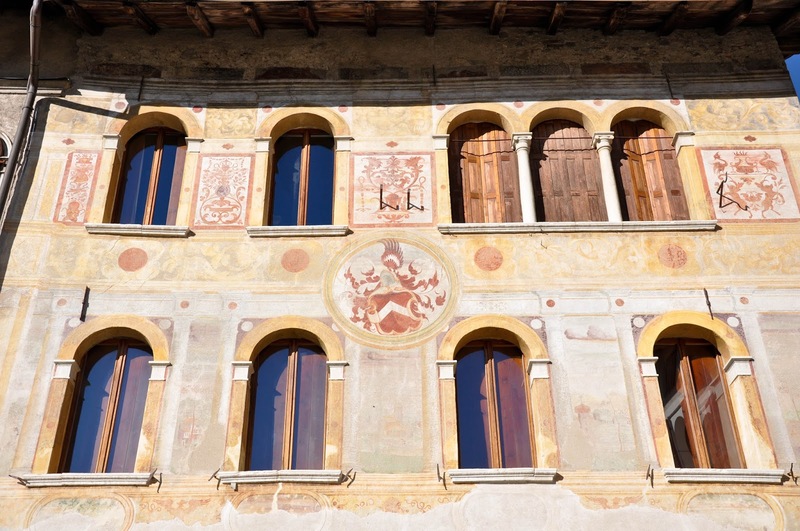 The square was surrounded by beautiful palaces with arcaded loggias and frescoed walls. 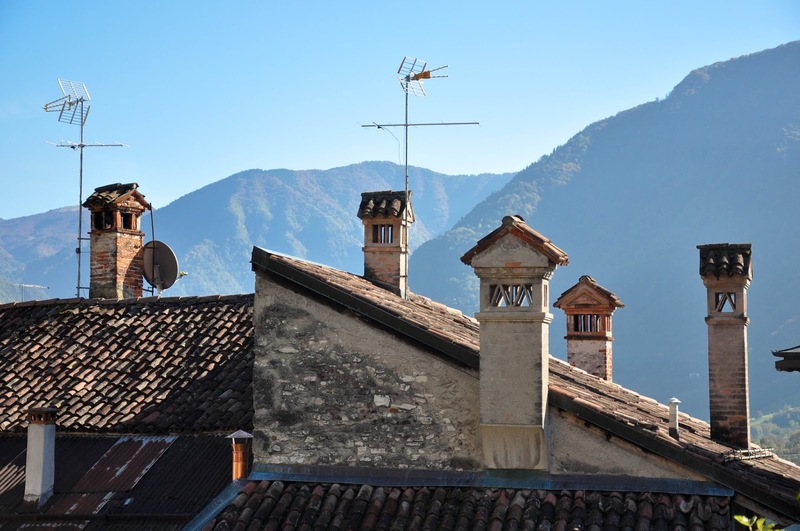 The peaks of the surrounding mountains could be seen above the rooftops with their distinctive chimneys. It was peaceful and beautiful. On one side of the square there were large stone troughs now completely dry. Above them a small church stood up. 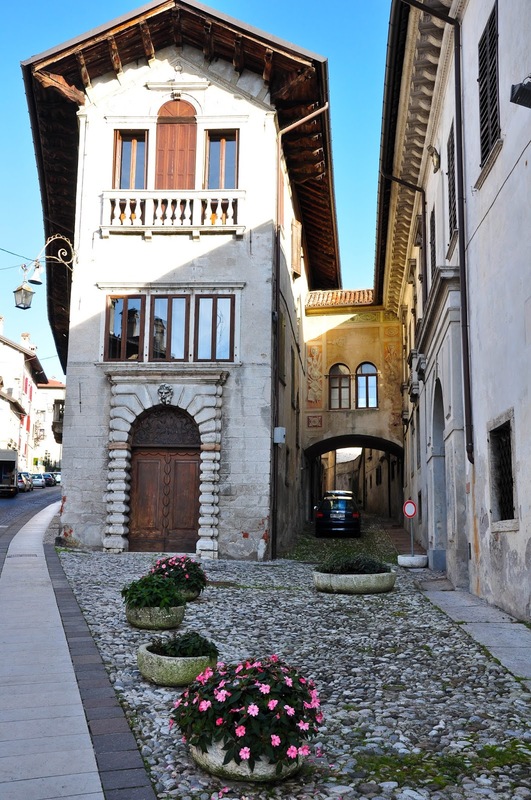 A steep cobbled path led away from the square up to the Alboino’s Castle. Autumn was in its element in the castle’s grounds. Tall tree with bright yellow leaves stood guard. The high point on which the castle had been built offered inspiring views to the surrounding mountains. A bit of snow could be glimpsed on some of the craggy peaks. 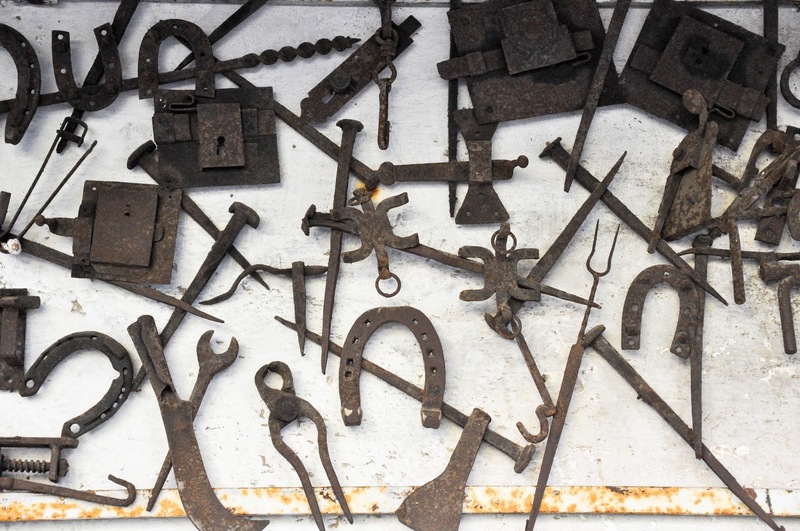 The castle itself is not open for visits, but a blacksmith’s studio is housed in its building. 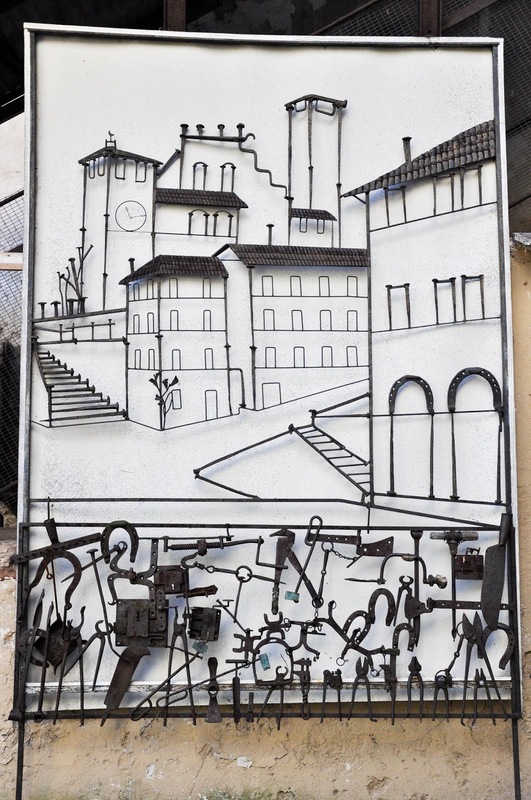 Collections of old tools had been creatively arranged around the courtyard and a large panel recreated in iron and steel the castle itself. Back to the square, we headed to the famous Sena Theatre in the splendid Palazzo della Ragione. Unfortunately it was closed right on the day that we were there, but we were cordially invited to return the day after. 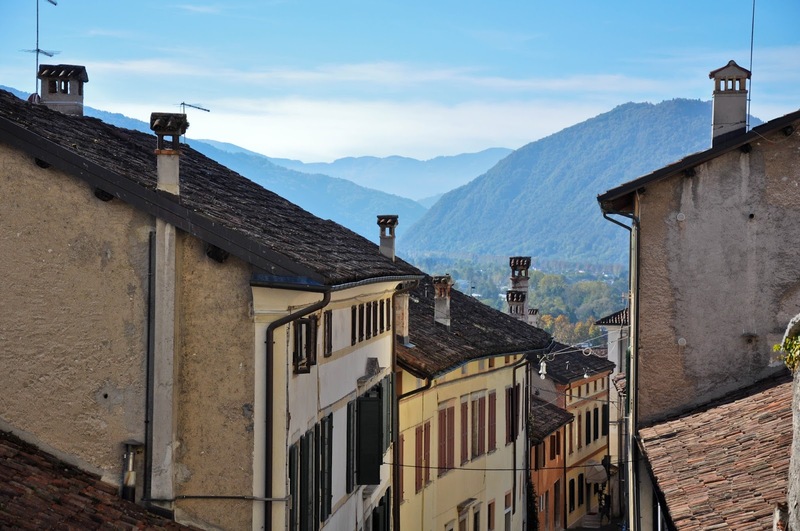 Still, we enjoyed the views of Feltre from the loggia of the palazzo, with its curving streets and mountainous backdrop. 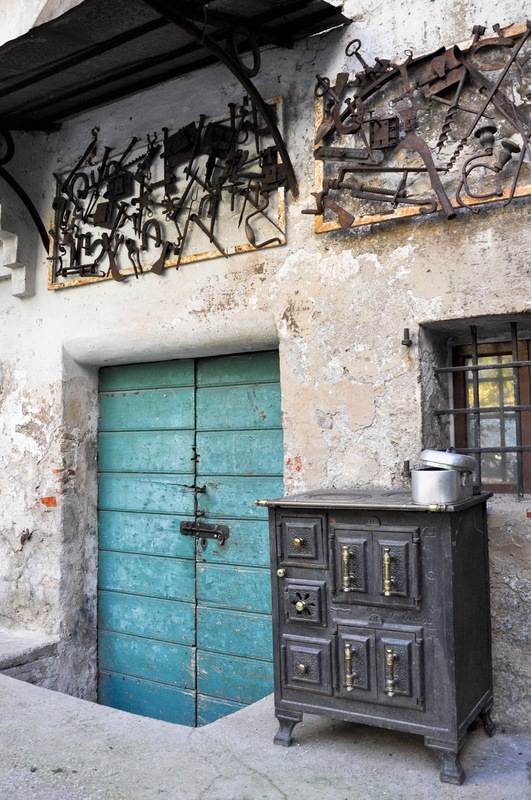 From there, we simply wandered through Feltre, taking in the painted houses along its streets. 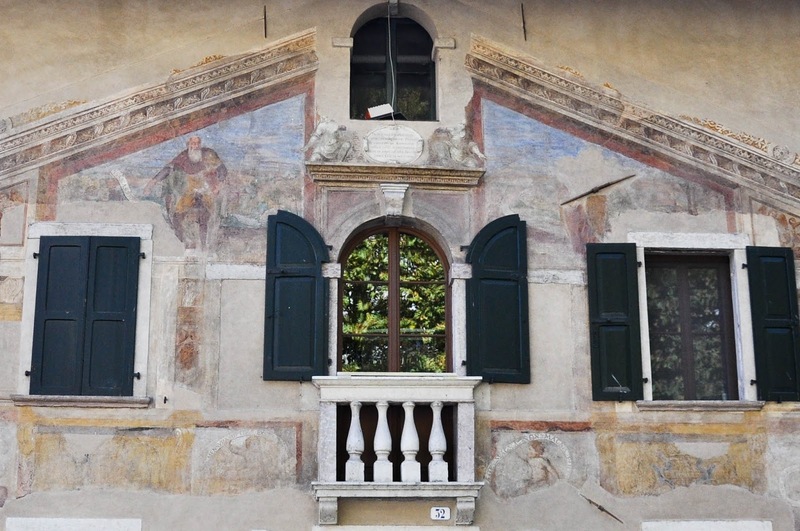 Down the imaginatively called ‘Via Mezzaterra‘ (Street ‘Middle Ground’) the facades of the many palazzi were covered with lavish but now faded frescoes depicting classical scenes, maids and knights. It was like walking through an open-air museum. 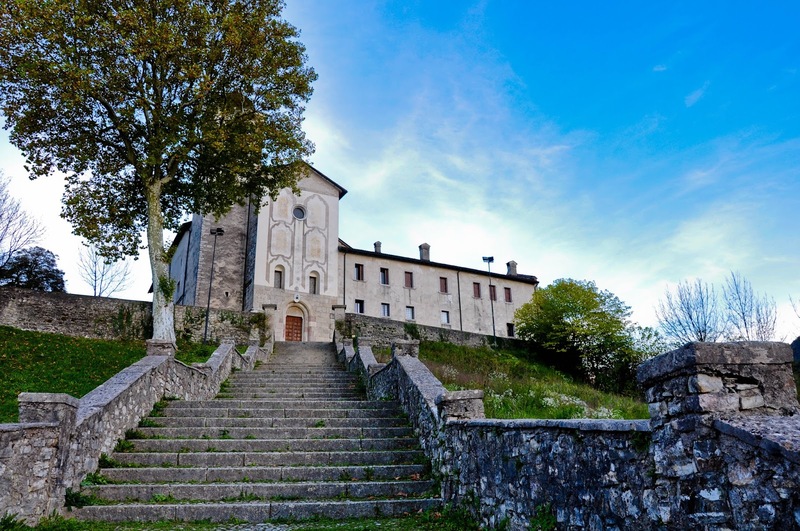 It was now late in the afternoon and we had to leave, but not before we visited the Sanctuary of St. St. Vittore and Corona which was founded in the 11th century and can be seen just a few kilometers out of town. 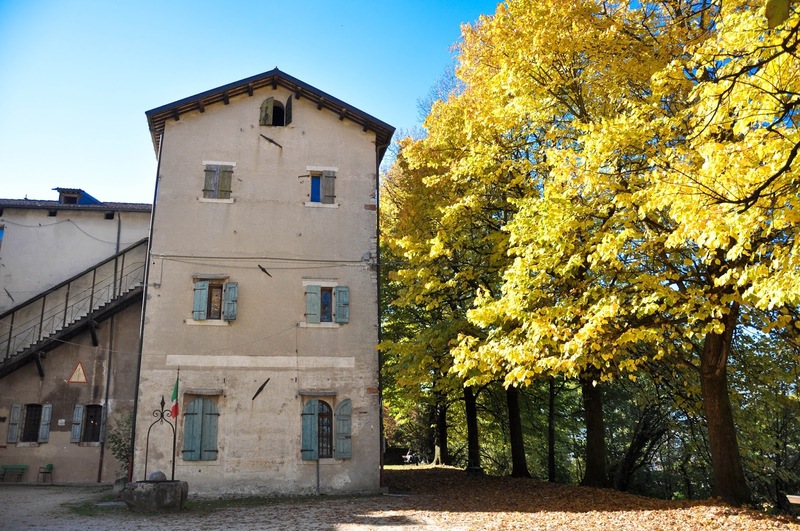 Feltre turned out to be a great day out – full of discoveries and beautiful views under the warm autumn sun. 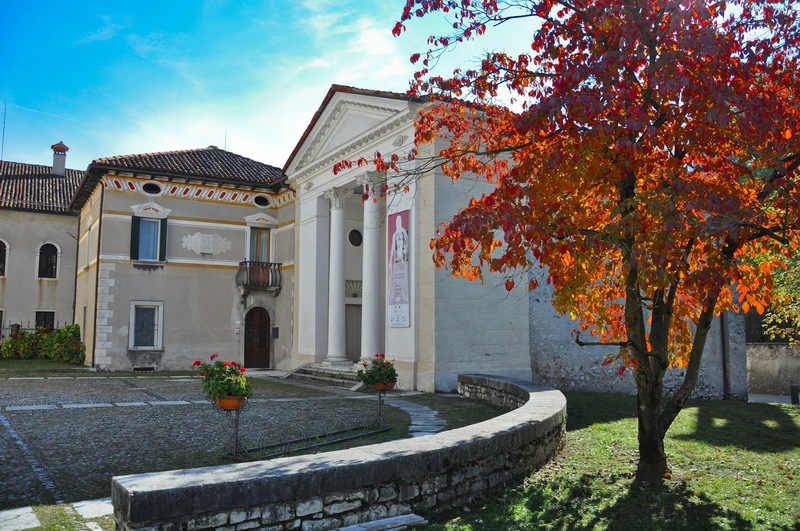 If you are ever stuck for ideas what to do in Veneto, head there or, if you have already been, open a big map (either real or virtual), close your eyes and point your finger. You will be in for a surprise.